Stuart Bingham's snooker schooling in Essex could hardly have been better. "I remember getting my first car when I was 17," Bingham, the world number 10, told BBC Sport. "I used to drive to Ilford to practise with Ronnie O'Sullivan, Steve Davis and Ken Doherty. "It was like a YTS scheme, I suppose." Some scheme. The apprenticeship obviously worked and all four could be reunited for Tuesday's World Championship quarter-finals. The serious business takes place on the Crucible baize, with 38-year-old Bingham facing 'the Rocket', a five-time world champion. Six-time champion Davis could well be in the commentary box, as could Doherty - the 1997 Crucible winner. The two onlookers will be casting their eyes over a legend of the game and a player who really has come of age in the past four years. Bingham only won his first ranking event, the 2011 Australian Open, at the age of 35. But he is now firmly established among the sport's elite. He has won three tournaments this year, the same as Mark Selby and Shaun Murphy, and has made it through to the last eight at snooker's showpiece event for the second time in nine World Championship appearances. However, his mates were not convinced he was destined for great things when he left school at 16. "I remember doing my last exam at school, and I went up the club and knocked in my second 100 break - so I wasn't good then," recalled Bingham, nicknamed 'Ball-run'. "I wanted to be a pro snooker player but a few of the friends who I still see said 'you'll never be good enough'. "They thought I would be a waster. But eight months later they saw me and said 'wow'. I was making 100s every day because I wasn't at school and I was practising all the time." Basildon-born Bingham only started playing at the age of 13 but he was soon hooked and his passion remains as strong as ever. 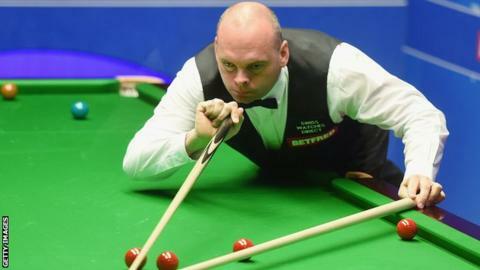 "I am a snooker fan - always have been since I got into it and always will be," said Bingham. "I go on holiday and on the the first day I want to get home because I want to practise. "I drive my wife Michelle mad. She says, 'we have just got here, chill out'. I see a pool table and can't help myself. I think 'I've got to have a go'." Bingham briefly jokes about being a hustler, but the financial rewards of his recent success at a time when snooker's schedule is packed means he is making more than a decent living without tucking up oblivious holidaymakers. In that scenario, his low profile - despite being one of the game's leading players - could come in handy. But he would dearly love to be mentioned in the same breath as O'Sullivan, Neil Robertson, Judd Trump, Ding Junhui and Murphy. Improving on his record at one of snooker's main events and making a very good season "great" or "exceptional" would help. "Maybe a few players don't get the credit they deserve," added Bingham. "But I am happy to do my own thing. "Looking at my records in the big three, the Masters I have never got past the last 16, the UK I have got to the semis in the last two years and the Worlds I haven't got past the quarter-finals. "Maybe it's my own fault that I am not mentioned and go under the radar because I have not done what I should have done. "But I want to do well for me. And the Crucible is a place where I would love to do well. I put this tournament on a pedestal." Bingham came close to reaching his first final in one of snooker's big three in this season's UK Championship, taking a 4-1 semi-final lead over O'Sullivan before losing 6-5. And it was O'Sullivan who ended Bingham's Crucible hopes in 2013, dishing out a 13-4 defeat. Ronnie ripe for the taking? Five-time winner O'Sullivan said after his last-16 victory over Matthew Stevens that he "doesn't get excited" like he used to at the Snooker World Championship, adding he has "lost motivation" after the success he has had and that he feels no pressure to add to his list of wins. "I think the key is not to go 7-0 down before you start," said Bingham, half-chuckling, half grimacing at the memory. "You have to take your chances and I had chances in six of the first seven frames. "But Ronnie is the best player in the world - he's a different breed." Bingham, dad to three-and-half-year-old Shae and step-daughter Tiegan - "11 going on 20" - has remained very grounded despite a fine season. "My little boy loves it," said Bingham. "He has his own snooker table now. I came home after five hours of practising the other day and he just said 'daddy, snooker'." Perhaps there could be another Essex potter in the making, to follow in the footsteps of O'Sullivan, Davis, Ali Carter and S. Bingham senior?